10992 - Blending sand is a unique alternative to the unity candle-lighting ceremony. 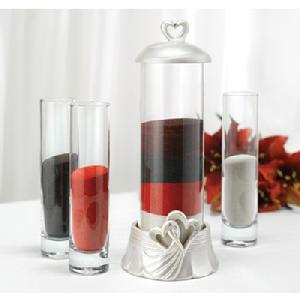 Each small cylinder represents the bride, groom and officiant or children of the couple. Sand from small cylinders is blended into larger cylinder during ceremony. Set of four includes large cylinder with glazed resin base and removable lid carved with hearts featuring rhinestone accents and three smaller cylinders. Large cylinder, 9" tall, 3" in diameter; 11 3/4" tall, 4 1/2" in diameter including lid and base; small cylinders, 7 1/2" tall, 1 3/4" in diameter. 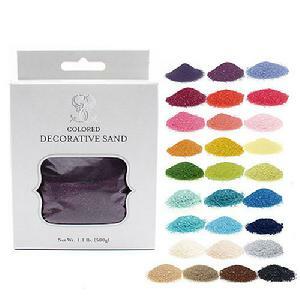 This sand is also suitable for other decorating projects such as table centrepieces, candle holders, favours with a beach theme or anything else that needs a little splash of colour. 500 grams per package.